For years, Brian and I had little to say to each other due to the icy chasm of our eight years difference in age. We had few common interests, after all. Not until I reached adolescence did our cold war start to thaw, a more or less civil diplomacy emerging in the unlikeliest of venues: on the virtual football fields, baseball diamonds and tennis courts of pioneering Intellivision video games. It was my older brother, who followed sports and occasionally actually played them, versus his nonathletic and sports-illiterate sibling in highly competitive contests of manual dexterity and hand-eye coordination. Countless battles unfolded on the color screen of our wood-paneled console television as we stretched out on the living room floor and blindly manipulated the controllers, keeping our wide eyes locked on the action. Sometimes we were woefully mismatched, as when we faced off in football. Clearly Brian had the far better grasp of strategy. I had only one effective weapon in my pitiful strategic arsenal, a potentially devastating play that I called The 9929 Twenty-Yard Fadeback. Named for the four-digit code one entered into the controller to call a play that included a receiver going long, the scheme exploited a curious anomaly of Intellivision Football: its quarterbacks never threw too short nor tossed the ball out of bounds, instead firing off passes that would spiral all the way off the scrolling screen if they were not caught. By some strange compromise of gameplay design, those golden arms could accurately throw the length of the football field. The 9929 worked like a charm, provided that I could entice a prolonged rush. I simply ran my quarterback twenty yards backward, made sure Brian wasn’t in between me and my offscreen receiver, and let ‘er rip. One 80-yard pass later, my isolated receiver would dash alone into the end zone. Unstoppable if you didn’t see it coming. Of course, it soon became impossible for me to entice Brian into a prolonged rush. As soon as my quarterback retreated more than five yards, my brother was on the alert to abandon the rush and intercept the ol’ 9929. I don’t think I ever won a single game of football. I fared much better in baseball, which required no strategic decision-making beyond deciding what kind of pitch to throw and when to swing the bat. The rest was all reflexive. If you had the chops to instantly activate any of your fielders by touch, then you were as good as anybody. Consequently, neither of us dominated in baseball. Brian would win one, then I would win one, all to the primitive, 8-bit approximation of an umpire growling Yer Out!, which actually sounded more like some sort of digital belch. It was tennis, though, that brought out our most intense competition. We were bitter rivals on the court, and if a sportscaster had sought a narrative suitable for dramatizing our struggle, it would have been the underdog story of the little brother who won games against big brother but never managed to take a set. Serve after serve, back and forth the advantage went, yet Brian inevitably emerged triumphant. As the older brother, Brian usually took the high road even in the heat of battle. However, he was not above ragging his opponent when necessary, nor was I above being rattled by it. Most unfortunately, I could never match his intimidation, and he knew it. If his circumstances ever turned desperate, he could recover lost ground by shrewdly hammering away at my psyche. This was the situation he found himself in one afternoon when I made the unprecedented personal accomplishment of winning the first four games of a set. It was time for Brian to bring the mental heat. “Thankyousomuch!” was his first volley, a smugly delivered rush of syllables that he let loose with an icy smile after winning a point. I didn’t even know that I was being messed with at that point, focused as I was on continuing my streak in order to win a set for the first time ever. A few plays later, I heard it again. Thankyousomuch! And here I made a colossal mistake. I gave my opponent a sidelong glance that conveyed my annoyance. I might as well have slathered my leg with beef broth and kicked a junkyard dog. It was all the provocation he needed. Now that he knew I was irritated by his new verbal tic, it was time to take the intimidation to a new and lower level. He waited until I made an error, somehow failing to return a ball that was hit right to me. Thankyousomuch! He was taking credit for my mistake! I was incensed, yet little did I know that my fury was the beginning of the end. While I fought harder and harder to keep my advantage, Brian was pulverizing the foundation blocks of my mental game. He knew what he was doing, but I couldn’t see it. I turned to him and unleashed a torrent of protest that was mere fuel for the fire. Brian just flashed a Chesire Cat grin and chuckled, and his complete lack of remorse only deepened my indignation. I was already off my game, but I lacked the maturity to compose myself and see my lead through to victory. He won the game, then another, and though he should have been the one sweating bullets, I was the one who felt like I had everything to lose. My play became sloppier. I missed more points that should have been mine. Brian took another game. I flailed about under the fear of what had the potential to be my most embarrassing loss ever. I made another stupid mistake, and then Brian let loose another one of his infernal proclamations of Thankyousomuch! “Thankyousomuch! Thankyousomuch!” I blurted out in exasperation. Brian said nothing but began to laugh gleefully. “It doesn’t even mean anything anymore!” He clutched his side and vibrated with mirth at my outburst. “You might as well be saying…” I grasped furtively for random words, “…tablechair!” My brother roared with laughter, but I was serious. He was about to get a taste of his own medicine. The first chance I got, I unleashed my lethal non sequitur. Gloating over an ace, I attempted an ironic smile and vindictively whispered, “Tablechair!” This tactic failed to achieve its desired effect. Far from being intimidated, my brother was merely amused. He knew the set was his. I was clearly self-destructing. He could have remained silent for the rest of the set and won without further provocation. But it’s hard for an aggressor to resist another twist of the knife, especially when he finds it funny. And so Brian stopped saying Thankyousomuch! every time I made a mistake. Instead, he said Tablechair! Brian won the set, 6-4. Shameful? Perhaps. 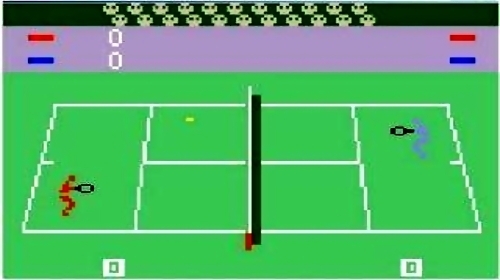 But as John Lyly observed over four hundred years ago, “The rules of fair play do not apply in love and war.” Never was it more true than on the virtual battlefield of brotherly rivalry we called Intellivision Tennis. I must say that I always enjoyed our intellivision competitions. I think you were just too young to handle the psychological onslaught of my ultra competitive nature. You certainly deal with it better as an adult, with the possible exception of the Scrabble PA incident. it’s good to get the competitive juices flowing. Let’s play some hockey soon.